Michael Gomez Films started pre-production of the latest film “Marco and Mimi” written by Amy Pearce-Hayden. The story of this chance encounter is based on true events and is an endearing, exciting and mysterious account of when two people meet and feel an instant connection, are drawn towards each other and yet bring more than what is apparent into the exchange. 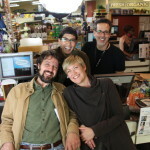 Filming is scheduled to take place at “Mother Earth” grocery store. Stay tuned for more updates!! Marco and Mimi… Filming Completed!